RECOGNISING EXCELLENCE WITHIN THE HEREFORD BREED BY IDENTIFYING SUPERIOR AND FUNCTIONAL, HIGH PERFORMING FEMALES AND THEIR SIRES. 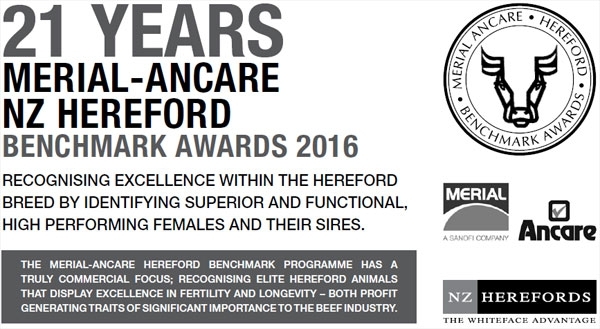 The Merial-Ancare Hereford Benchmark programme has a truly commercial focus; recognising elite Hereford animals that display excellence in fertility and longevity – both profit generating traits of significant importance to the beef industry . The NZ Hereford Benchmark programme has now reached its twenty first year milestone. This highly regarded programme has been supported since its inception with generous sponsorship from Merial-Ancare NZ. 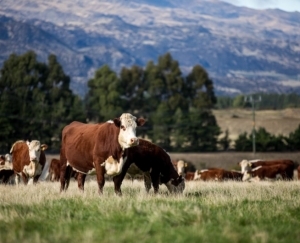 The NZ Hereford Association acknowledges this long standing partnership with Merial Ancare. New Platinum Benchmark status has been awarded to Keelryn Irane P2, bred by the Keelryn stud and now owned by D & S Steele of the Davandra stud. Gold Benchmark status has been awarded to another Keelryn female, Keelryn Irane 163, also owned by the Davandra Stud. Orari Gorge Station has added another gold benchmark dam to their collection with Nithdale Pearl 070168 gaining status in 2016; bred and owned by Orari Gorge Station. 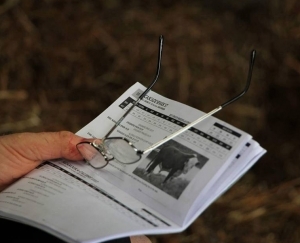 With the use of Benchmark information, commercial cattlemen can select proven superior Hereford genetics to use within their beef breeding operations. The programme recognises cows that have the ability to produce a live calf unassisted, on time each year and rear that calf to an average or above average weaning weight. This is what makes a commercial cow herd viable and gives the commercial beef farmer confidence in registered Hereford breeding programmes. Profit driven ($ value) Selection Indexes have once again been incorporated into the Benchmark qualifying criteria. This is criteria which must be met before an animal is credited with Benchmark status. The inclusion of the Export/Maternal and Hereford Prime/ Maternal Selection Indexes (animals must be in the top 20% of both Indexes) reinforces the purpose of the Benchmark programme, to identify those superior, high performing cattle. Ancare Hereford Benchmark animals can be found. Average calving interval of 391 for first three calves, 382 for first four calves, 378 for first five calves and 375 for first six calves. Maternal value in top 10% of Trans-Tasman Hereford analysis. Calves must be reared by own dam, have a 200 day weight entered and dam must have a registered calf born no more than two years prior to current grouprun cutoff. Calving Ease direct in top 85% of Trans-Tasman Hereford analysis. In the top 20% of Trans-Tasman Hereford analysis for Export/ Maternal & Hereford Prime/Maternal Selection Indexes. The dam of three Benchmark dams. Can be any combination of gold, silver or standard.